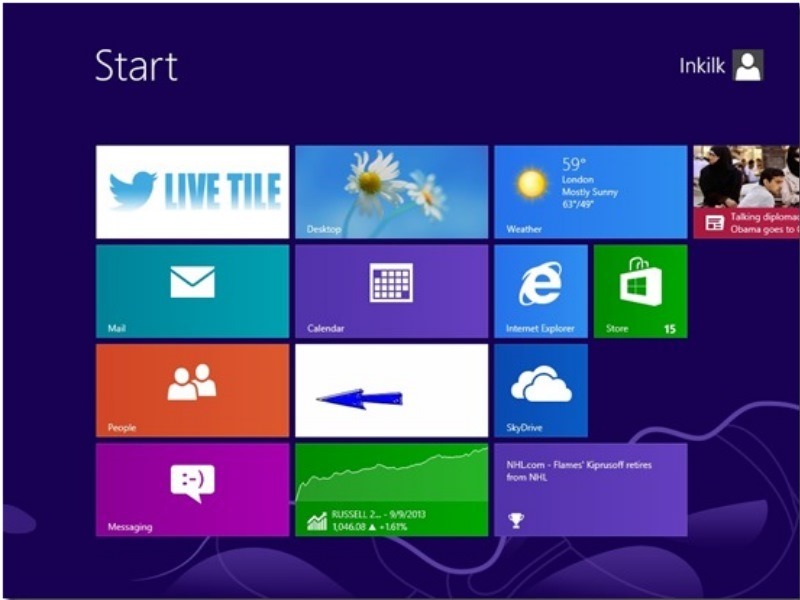 Twitter LIVE TILE is a free Windows 8 Twitter app to create a Twitter Live Tile on Windows 8 Start screen. Using this app, you can quickly see what’s happening on Twitter whenever you switch to the Start screen. 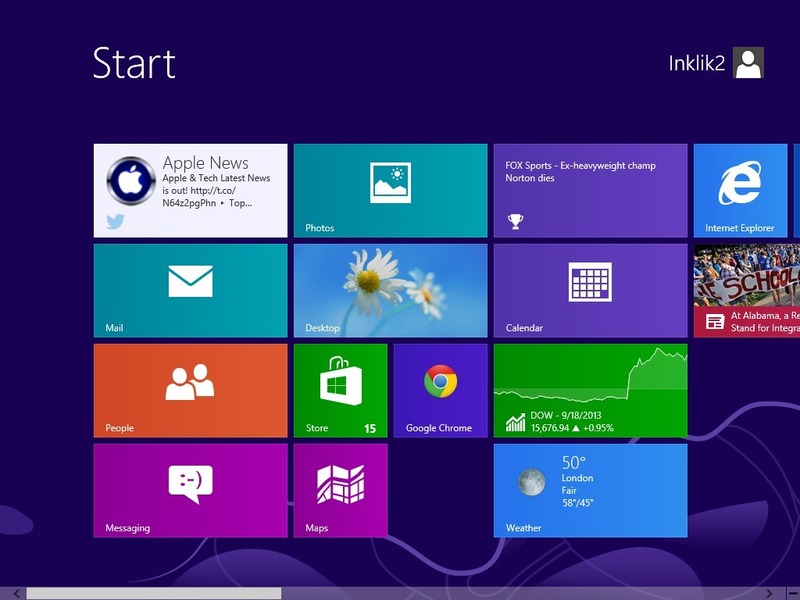 The app will make a Live Tile of your Twitter account, which will remain glued to your START SCREEN. It will then show updates from your account, which you will be able to view on its Live Tile. Clicking on these updates will take you to the app’s screen, where you can view and read Twitter updates from your entire network. The app updates itself in every 15 minutes for latest Tweets from your account. You can find it under the Social category in Windows Store. Use the Win + Q key combination to search for the app, or click the link given at the end to view the app in Windows Store. When you first launch this free Windows 8 Twitter app, you would be asked for Authorization details like your Twitter Username and Password. On providing these credentials, you would be linked by the app to your account. Initially, the app will take some time in reaching your account because some checking is involved to link your account. Then the following screen will appear in front of you. You can make preferences for the Timeline in this free Windows 8 Twitter app, according to the User whose Tweets you want to see. You can choose from options like Home Timeline or you can choose to get tweets from a particular User. All the Tweets for that particular User will then appear in a vertical tab. The app will refresh your account after every 15 minutes to get the latest Tweets and show them to you. 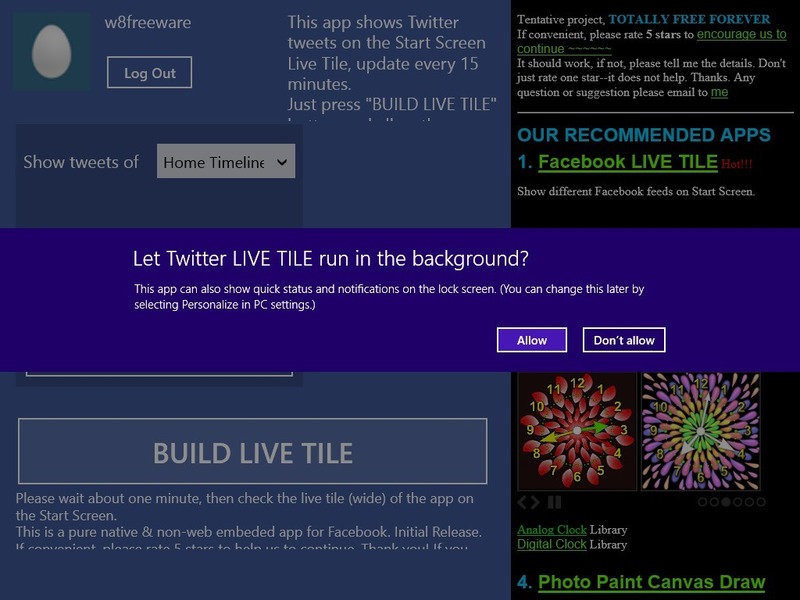 Then in order to enable Live Tile in this Free Twitter app, you just have to click on the BUILD LIVE TILE option. As you allow this free Windows 8 Twitter app to enable Tiled Notifications about your Twitter account, the Live Tile for your Twitter account will get created and it will pin itself to your START screen. You initially would have to wait for a minute or two. When the tiled notification is enabled, you will be able to get live updates from Twitter on your Start screen. Plus, you can also access your Twitter account right from this Start screen. Just click on the live tile and view all latest Tweets in your account within this free Windows 8 Twitter app. You can Log out anytime, and can log in again whenever you like, or can again log in as a different user. The main advantage of this free Windows 8 Twitter app is that you don’t have to open your Twitter account in a browser tab or in a client app; every update from Twitter is present right on your Start screen. Nice user-interface: The user-interface is quite nice. Anybody can easily work out his way to use the app. Ease of access: The app allows you to access your Twitter account Fast and Easily and that too without the restriction of logging in each time. Tiled interface: The ability of the app to form a tile that will cling to your Start Screen, will give you the ability to view updates and go to your Twitter account right from your Start screen. Navigate easily among your Tweets. Finally, to conclude, I would like to say that this free Windows 8 Twitter app is quite good. Users can easily understand its working. However, I would like to say that if there was an ability to update your Tweets from the app’s screen, the app could have worked better for me. The user has no ability to Tweet himself and can just see updates from his network. Also, there’s no way to search for any user. So up to a limit, the app is good and can be given a try.